If you are conversant with the predecessor of the Oukitel K10 which is the Oukitel K10000 Pro, you would know it is not like your conventional smartphone.This is a battery juggernaut and it takes it to another level entirely with the incredibly massive 11, 000mAh battery. Yes, 11, 000mAh! Which is about the battery of like 4 smartphones put together. Pretty amazing right? In addition to this, it has mid-range specs but is quite heavy and bulky due to the monstrous battery capacity inside. As much as Oukitel will like to make this smartphone fashionable even with the leather back it has. There is nothing it can really do in this aspect with the battery size thrown in. For example, the smartphone has a thickness of 12.5mm and weighs a whopping 283g. This figures highly suggest how uncoventional the smartphone is and even the 18:9 aspect ratio cannot help the aesthetics here. However, the build is quite sturdy and even the leather has a pleasant feel. Most of today’s smartphone comes with a large display and the Oukitel K10 comes along with a fairly large screen of it’s own. You would be enjoying the view from a 6.0-inch Full HD+ display which is not at all bad for a mid-ranger. Also, the smartphone doesn’t really have much bezel reduction as some other modern smartphones. The main highlight of the smartphone comes in the battery department which is stacked up to the brim. It ships with an 11, 000mAh battery which is said to be good for like 6 days on average use.There is fast charge in play too which charges your battery for about 5 hours and you are good to go. Video playback at full brightness consumed 48% of the battery after 23 hours according to Oukitel. Furthermore, there is enough memory for hitch free navigation between apps on the smartphone. For that you’ve got a 6GB internal memory and 64GB of storage space that can be expanded to128GB if you so wish. On a final note, the Android 7.1 Nougat on the smartphone is a stock OS. 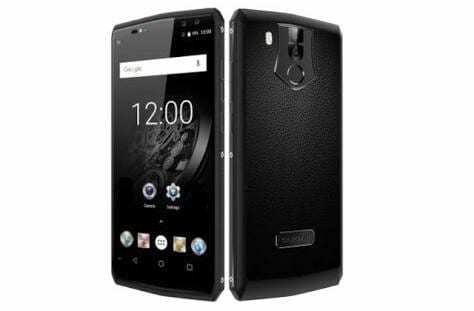 The smartphone is available on various online stores and retail outlets at a price point of around 98, 000 Naira depending on the deal and your location.